Each year one of Shakespeare’s romantic comedies is chosen and played out in makeshift stages and the “back-scene” tents, while players with full customs and makeup sometimes deliberately modify parts of the script and make it even funnier. They also fool around and interact with audience before, during and after the show. All you need to do is to grab a folding chair and perhaps a bite of something, and walk to the nearest park performing the year’s play. The theater is always outdoors, so don’t forget to hope for a clear sky too, and of course, donate generously! Repercution theater relies entirely on the financial support of small and big sponsors, donors and the audience. I have been to more plays than I could remember and still look forward to summer to attend yet another one. This year I watched “Taming of the Shrew” at Westmount Park and enjoyed everything about it: the good humor, playful acting, cheerful audience, beautiful park, and the excellent weather. See here the official website, link to their blog and the season’s full program and have a wonderful Shakespeare in the Park! Thank you so much for your exciting report. 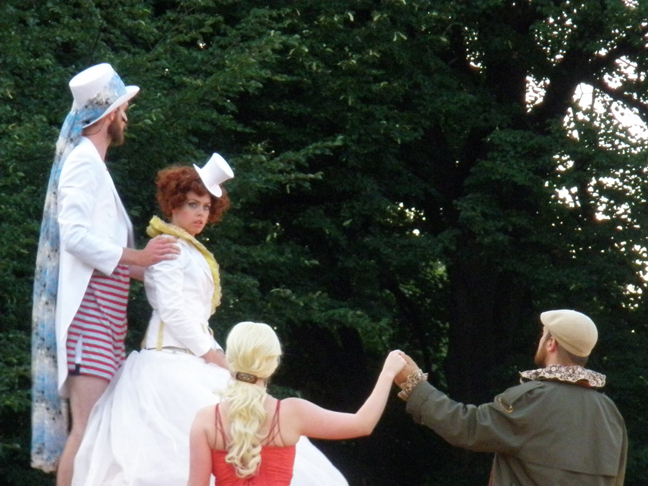 It encouraged me to go to Trudeau Park in Cote Saint Luc tonight and see the play. I enjoyed it a lot.